This article originally appeared in SleepyHeadCENTRAL.com on March 9, 2019. Reprinted by permission of the author. On Feb. 20 and 21, the National Safety Council (NSC) presented its first annual Workplace Fatigue Conference. It convened a diverse cross-section of leaders in the field of workplace fatigue management. This included local risk managers and human resource representatives from regional industries. For Washington state, that includes mining, oil refineries, aerospace, public transit, commercial driving, sleep medicine, medical workers and business management. On Feb. 20, several speakers gave presentations or participated in panel discussions on relevant topics. An overarching message sleepyheadcentral (SHC) was pleased to hear repeated was the importance of making sleep a priority in the workforce. Granted, there are multiple reasons for workers to feel fatigued. Consider poor diet, limited exercise, emotional stress or fatigue due to catastrophic events. However, poor sleep represents a universal problem among all workers regardless of their status within the company. The issue of poor sleep is not just a concern for big business and its bottom line. A sleep-deprived workforce is a much larger public health and safety issue — potentially of epidemic proportion. The topic of workplace fatigue management is dense and multilayered. Workplace fatigue is difficult to quantify, and social dynamics drive attitudes about sleep and work, which run at odds with one another. For the ordinary American, however, problems with workplace fatigue aren’t merely administrative, but extend beyond the interests of employers and workers. As one example, drowsy driving accidents not only cost millions in damage and loss of life, but they can also destroy entire families and valuable property. Anne Kirsch, senior adviser for corporate safety initiatives for New York state’s Metropolitan Transportation Authority (MTA), delineated the vast changes her agency has adopted in the wake of several recent train derailments. It comes as no surprise that preventable fatalities from these catastrophic events tie in to sleep deprivation. Tom DiSalvi, vice president of safety and loss prevention at Schneider National Inc., shared the company’s recent policy requiring — and paying for — all sleep apnea testing for its commercial fleet drivers. This effort to remove untreated sleep disorders as a risk factor for highway truck accidents earned the company the NSC’s prestigious Green Cross for Safety Excellence Award in 2019. Feb. 21 opened with an energizing discussion about using sleep health as an opportunity for improving workplace safety and productivity. This presentation was delivered by former National Highway Traffic Safety Administration President Mark Rosekind. This session, led by sleep medicine researcher Dr. Charles Czeisler (Harvard Medical School, Brigham & Women’s Hospital), sought to uncover challenges and solutions for implementing sleep health programs in businesses of all sizes. Ways to enforce therapy compliance, while respecting employee privacy, and remembering that employees are human capital, were other topics. This session focused on ways to make change in regulatory and legislative policy (from the “top down”). The dialog, hosted by Jane Terry, senior director of government affairs at the NSC, highlighted the challenges of pushing through regulatory requirements. The group seemed to agree that federal standards provide what they consider a “bare minimum” standard, which most corporations seem loathe to meet. Several leaders in the group suggested these low standards shouldn’t be something that corporations rise to at all. Rather, the goal should be for businesses to far exceed these standards as a matter of best business practices. Christopher Barnes (University of Washington’s Foster School of Business) drove this point home on day one. Companies stand to boost their return on investment when they prioritize fatigue management. 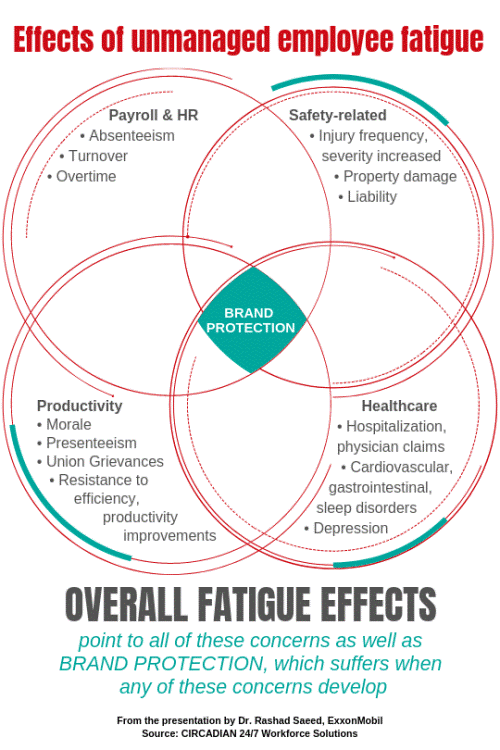 (For comparison, see the above diagram, which illustrates the potential costs of employee fatigue.) According to this commentary by Barnes, there are ethical considerations. Specific industry challenges in this breakout session included the safety concerns for ambulance drivers, and aerospace engineers facing an aging workforce — with limited incentives for younger employees, who still choose work over sleep at the expense of their health and longevity. Many thanks to the NSC for a valuable, relevant and intensive program. Efforts some companies are making to bring family into the workplace fatigue conversation. Better sleep health protects both loved ones and wage earners. It also inspires them to seek and succeed at therapies for sleep disorders that might place their jobs at risk. Privacy concerns can erode trust between workers and employers. Devices at issue include drowsy driving dash cameras, antigraphy bands (such as FitBit sleep trackers) and compliance data collection (such as in PAP machines). The current fatigue management legislation introduced over the last few years is probably not going to change with an anti-regulation president at the helm. Employees are willing to share their sleep disorder experiences in a work-hosted support group setting if they know they won’t be penalized for being proactive. Sleep wellness programs, by and large, only work if they are mandatory for employees. Employers who schedule 12-hour shifts for their workers need reminding: In addition to striving for eight hours of sleep while off duty, these same workers still must budget time to commute, eat, shower, spend time with loved ones and take care of household concerns. Four hours a day is not considered adequate time to complete these activities of daily living before returning to work. 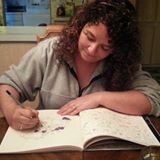 Tamara Sellman, RPSGT, CCSH, is an independent journalist specializing in patient education and activism. She curates the sleep health clearinghouse, SleepyHeadCENTRAL.com; publishes the quarterly sleep-themed literary magazine, Vitamin ZZZ; writes the “While You Were Sleeping” blog series for AAST; contributes to A2Zzz; gives presentations on sleep health for technologists and the general public; writes and produces the Journal Club (AAST) with Rich Rosenberg; provides blog content for private physician clients; and writes about sleep health on assignment.